With David Lynch’s cult TV series Twin Peaks returning to TV screens after a 26-year hiatus, the haunting central music from the show – ‘Laura Palmer’s Theme’ – is also back, along with the Laura Palmer character whose murder was the basis of the original show. In this video, composer Angelo Badalamenti explains how the dark and mysterious ‘Laura Palmer’s Theme’ was written in less than 10 minutes, with director David Lynch sitting beside him at a Fender Rhodes piano. For composers who aspire to write for film or television, it’s a masterclass in how to create music that accurately interprets the on-screen emotion or atmosphere of a particular scene. Most experienced songwriters would probably agree that trying too hard to make a song happen — force-feeding the songwriting process — rarely leads to great results. A song that is laboured often lacks the emotion of something that comes naturally like a perfectly-formed idea that you just pluck out of the air (or, more accurately, out of your subconscious). “If you don’t try and force it, a song will find the proper moment to come to life,” says Valerie Simpson who co-wrote classic songs such as ‘Ain’t No Mountain High Enough’ and ‘Solid (As a Rock)’ with her late husband Nickolas Ashford. Neil Young holds a similar view: “If you don’t have an idea and you don’t hear anything going over and over in your head, don’t sit down and try to write a song. Go mow the lawn…”. When inspiration does come, though, don’t stop the flow. Take the chords, melodies and lyrics that come instinctively and accept that they may change during the creative process. 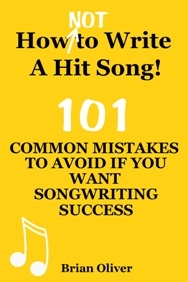 Don’t go chasing the ‘perfect’ melody or rhyme or the correct phrasing — just get the first draft of the song written. If you spend too much time trying to perfect one element of the song, you may lose your connection with the spark that ignited the idea in the first place. Above all, though, don’t try to rush a new song. Be patient. We’ve all heard the stories about classic songs that were written in 10 minutes, but the majority of well-crafted songs are actually the result of many rounds of re-writes and careful polishing. Ed Sheeran once told American Songwriter magazine that he’d spent five years working on a particular song. It just kept evolving, he said, so he kept adding more and more things to it. And Stevie Wonder surprised everyone by revealing that the new song he performed at this year’s ASCAP Expo, ‘Where’s Our Love Song’, was one he’d been writing since 1971!